According to the Idaho National Laboratory, the maximum voltage of the e-Golf battery pack is 4.10 volts, not 4.2 volts. The minimum voltage is 3.00 volts. The 4.10V at charging from the charger pack probably yields a finished charge level of 4.05 to 4.06V per cell. The actual chemistry is probably beyond that and at 4.20V per cell, which tends to shorten the life of the cells if recharged to 100%. Go to Battery University to learn more about battery chemistries and charging limitiations based on particular battery chemistry. Volkswagen went with a battery chemistry known for durability, large capacity, pretty high internal resistance inside the cells, and slow discharge rate, which limits acceleration performance in favor of turtle like performance for long, steady, slow, economical discharge rates and increased range per recharge. 0-100kph rates in seconds is not it's strong suite. 6 to 7 miles per kWh of discharge IS it's long suite, in city BLVD and residential road traffic conditions. You stated it backwards - the cells were selected for low internal resistance and therefore low internal heat generation. This is the primary reason that they decided to forego the active thermal management of the pack - they felt the internal heating was low enough that it wasn't needed. IMHO, they were wrong. Active thermal management (heating and cooling) may not be needed very often, but when it is needed, it's vitally important. Any EV battery will perform better under low discharge rates like driving slower and more efficiently. The relatively small capacity of 24kWh (2015 & 2016 cars) and the relatively poor aerodynamics of the Golf body just highlight the fact that the car works better at low speeds. miiumra, you are correct in everything you stated. I agree that VW should have added active thermal management, as it would have enabled a much longer battery life (just read an article at insideevs.com about how BMW expects the i3 pack to last at least 15 years and still have 70% net capacity, probably large due to active temp control) and they wouldn't need to discourage people from back to back DC charging sessions due to heat generation at high charge rates. Can you name an under $37k electric car with a cD lower than the e-Golf? Just curious, at that price point, what you consider good aerodynamics, because you can look at an XL1 model and see what VW can do with coefficiency of drag. The Hyundai Ioniq BEV has a CD of 0.24, I believe, and with a 28 kWh (net capacity, I think), gets the same range as the e-Golf with the 35.8 kWh (gross) battery pack. The base Ioniq BEV costs near $30K, I think. And it charges DCFC up to 100 kW and I believe it has battery thermal management, though it may be only air cooled, it's still better than nothing. ^^^^ This. Ioniq is way more efficient than the e-Golf, mostly due to aerodynamics. And it doesn't look weird like the 1st gen Leaf and the i3. It's $36,885 by the time you get HID headlights. 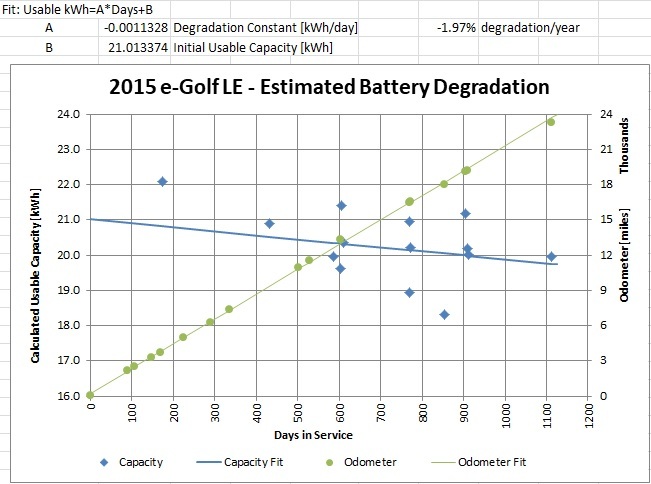 I have a final datapoint from our 2015 e-Golf. We extended the lease to bridge the time until we got our Model 3, but we have it now, so the e-Golf is going back on Monday. As I indicated before in this thread, I think this method is significantly flawed. However, I tried a couple times to take different data on consecutive days to highlight the variability in the results so people can judge for themselves. As you can see from the data above, the least squares fit line gives an estimated initial usable capacity of just under 22kWh and a degradation rate of 2.09Wh/day with a final capacity at the end of the trend line of 19.46kWh. However, the last actual data point was calculated as 20.0kWh. The calculated degradation slope correlates to 3.5% degradation per year. This scatter chart shows how the amount of battery used in the calculation contributes to the resulting value. The yellow and red lines represent data that is time and mileage adjacent, so there's definitely a correlation there. This last chart shows how the first data point from October 2015 skews the results. When that point is removed and least squares fit is performed on the remaining data, the slope of the degradation line is reduced to 1.13Wh/day and the estimated original usable capacity is lowered to 21.01kWh. That comes to less than 2% degradation per year. So, that's my data for from our car. It would be much better if we could get more accurate capacity data from the car's computers, but this methodology is the best I could come up with in its absence. The VIN ends in 907055 if anyone cares to look for it later. It's a Limestone Gray 2015 e-Golf LE. Congratulations on the Model 3 finally arriving, miimura! I'll be interested in hearing your thoughts on how you like it and how it behaves, etc. The Ioniq Electric is super, super efficient—my husband has one, and often has miles-per-kWh readings in the 5s. The guessometer shows estimated ranges on a full charge in the 140-mile range. 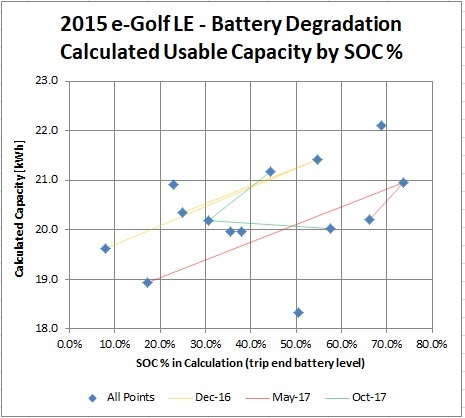 I realize some 2017 e-Golf drivers can see those ranges, too, but all that range on a 28 kWh battery pack? This is one slippery car! Still haven't gotten my e-Golf yet, but I'm hoping the 2018s are just around the corner. I'm sort of curious to see what Hyundai will do with the Kona Electric this fall (a 250-mile range is enticing), but I still prefer VW's styling and handling over Hyundai's. That being said, I do appreciate the effort Hyundai put into their first EV. I'm going to throw this out there as the math nerd in me can't help himself. The method you all use for calculating battery degradation is, as some have pointed out, limited by the data that VW gives you. 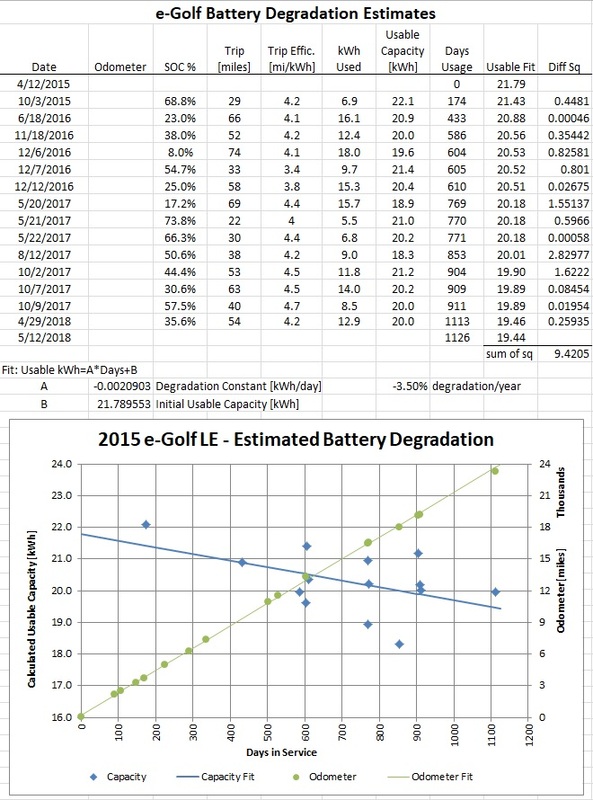 Every single datum you're using to calculate usable battery capacity only has two significant figures, and following sig fig rules, your answer will only have two significant figures. This is particularly relevant because we don't know how VW is arriving at these figures. For example, are they rounding up or simply cutting off the display after the second sig fig? If your average consumption figure is 4.3, does it mean the real figure is in the range of 4.25 to 4.34? Or is the real figure in the range of 4.30 to 4.39? I just started my own data collection on my 2019, and the data points on the graph will be two significant figures. In my case, my first three y-values are 31, 32, and 30. Just throwin' it out there.